I am really grateful to this amazing experience at Kunyu mountain Shaolin Kung fu academy. As a Belgium citizen, I always dream of joining such a nice setting. I feel calmer and I know more about my body..I would start by praising Shifu Gao, whose rigorous training led to push my limits. I am proud of what was accomplished here, and I highly recommend the extra training, as your Kung fu is as serious as you are. Only by training hard and respecting the values my master taught me could I find who I am. Life here in Kunyu mountain is good, translators nice and efficient.The Master helps me a lot. He improved my boxing skill and he was always there to answer my questions. The training was hard but it’s very important, don’t give up.I don’t know much about Yantai but the mountain is a very nice place and very quiet. 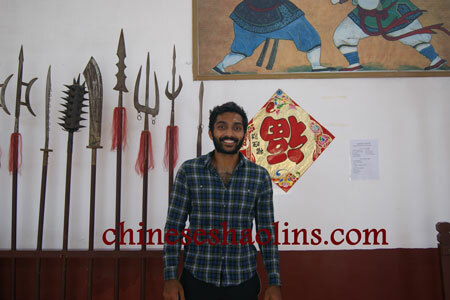 Ben trained traditional kung fu here for 8 months at Kunyu Shan. I wanted to get out of a big city (London). I have always, from a young age been interested in China and its history and culture. I benefited Discipline, routine and focus. Having set hours for classes, meals and sleeping. Qigong – learning and improving my ability to find peace within, despite the noise and distractions of the outside world. My master was excellent – I learned a lot from him. The fellow students helped a lot also. Older students were always willing to help. My experience at the academy was brilliant. I really enjoyed it. Master was excellent – pushing me when I needed it and also explaining things very well. The translators were all very helpful and friendly and I engaged talking to them. Daily life here with all the fellow students was very enjoyable.